My son is just like me…we don’t use soap with him in the bath..and have to be careful with anything we put on his skin. We discovered early in his life that he had inherited his mother’s tendency for dry skin, eczema and strange, mysterious rashes that appeared and disappeared without warning. When I was born only 21 years ago *ahem, 40* my mum discovered some very odd things about small people – not least that eczema could be serious, so much so that I was hospitalised with it not too long after I had been born. Red, raw, itchy, and not much fun at all; for me or for her. I still suffer with very dry skin, and need to be careful what products I use – we can’t use particular washing detergents otherwise my son starts itching and goes an interesting red colour. My chequered eczema past is why we have designed a little star for our to encourage kids to stop scratching using our reward charts. We were therefore delighted to be offered the chance to review Dove’s Pure and Sensitive Cream Bar, which is a new moisturising cleanser specifically designed to be gentler on the skin in partnership with the National Eczema Society. I am a busy mum, so don’t look after my dry skin as well as I might. The bars are fragrance and preservative free, as well as being pH neutral and hypo-allergenic, all with a view to making sure that skin isn’t irritated. My daughter snapped a picture of the cream bar – insisting on adding the shoes for some reason…they look rather cute I think, but are a little small for me..! According to my mum, I spent a lot of my formative years without a nappy on, as this meant that I was prone to less bouts of eczema and dry skin. I suspect it did cause my mum to be rather prone to bouts of terror. Can you imagine a one year old without a nappy let lose in your house!?!!? I bet my mum could have done with this advice all those years ago. Could have saved her an awful lot of washing don’t you think? Joking aside, it was a pleasant change for me generally. Its a bit early to tell if it has had a positive effect on the knees too, and I do plan on trying to continue to use it…though my daughter is probably going to have to remind me to put it on. I am not one to remember those beauty tricks. 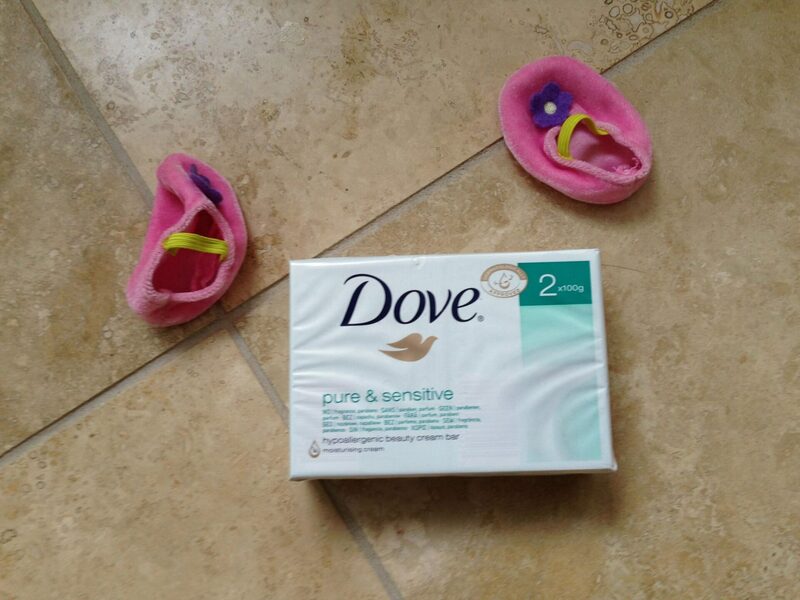 The idea behind the Dove Cream Bar is a good one – soap based products are hard on my skin, which is why I have stopped using them both on myself and my little boy. Even to my scientifically-trained brain, the bar appears worth a go. I may even use it with my son. Here is to hoping my knees never look back…. ….well, you know what I mean. I was compensated for writing this post, and sent products for testing. All the knees, nappy tales are chaos associated with mine and my son’s skin are my own. I am a member of the Netmums Blogging Network, a unique community of parent bloggers from around the UK who have been handpicked by the Netmums team to review products and brands on their behalf. I have been paid expenses and supplied with a product sample for this review but retain all editorial control. All my Netmums Reviews will display the Netmums logo within the post. It looks like soap, it does the same job as soap, but it isn’t soap! It’s a mild and moisturising cleanser which doesn’t strip all the essentials from your skin, leaving it dry and likely to break down, like soap does. Thanks for sharing quite an informative stuff. I have been dealing with dry skin problems from quite a long time and I tried so many products but they were of no use. Now I am gonna stick to every idea and suggestion that you mentioned above. Hi Helen, great informations on skin care. Thanks for guide!